Keylogger je naprava, ki zabeleži vse znake tipkane na tipkovnici, uporablja se za nadzor uporabnikov računalnika. 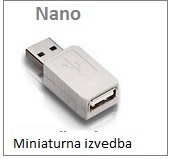 V naši ponudbi imamo najmanjše in najpametnejši USB keylogger na svetu! Keylogger is a device which records the keystrokes on the keyboard and lets you know a past conversation on PC, passwords, emails and other reading .. Hardware keylogger is completely undetectable with antiwirového software. Keyloggers offered in several variants. Basic versions only record keystrokes. 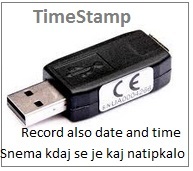 For long-term monitoring but it is advisable to use keylogger TimeStamp, which assigns to individual records the date and time they were taken.Because then view them much more comfortable. For the most demanding users, offer WiFi keylogger that all recorded data sent via email and you no longer have to walk to collect data infiltrovanému PC. Involvement keylogger is very simple and it can handle even a complete outsider. Keylogger simply připoit between the keyboard and PC, so installation is complete. PC does not need to install any drivers or anything.Installing keylogger therefore it takes just a few seconds . 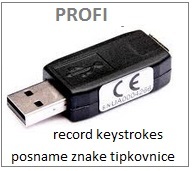 Records are stored on the internal memory keylogger, which are secured by 128-bit encryption, which made the records gets only authorized persons. Keylogger is your memory can store up to 100,000 pages of text. Disclosure of records held at the password that the user determines. For WiFi keylogger is not even necessary for viewing the records come with PC infiltrated into contact. Simply set sending data to a selected email and then you're enjoying the data directly in your email odkukoliv the world.